When your beautiful sunflowers begin to wane and the bright show is over, it is time to begin to think ahead to next year’s sunflowers. If you were happy with the sunflowers you grew and you would like an encore performance next summer, you need to harvest your sunflower seeds for planting next season. You will have to watch for the sunflowers to turn brown and bend toward the ground and get the seeds before the birds do. Watch the sunflower head as the petals shrivel and fall off. Wait for the back of the sunflower head to turn from green to yellow to brown. Use the knife to cut the sunflower head off the stalk after the back of the head has turned brown. 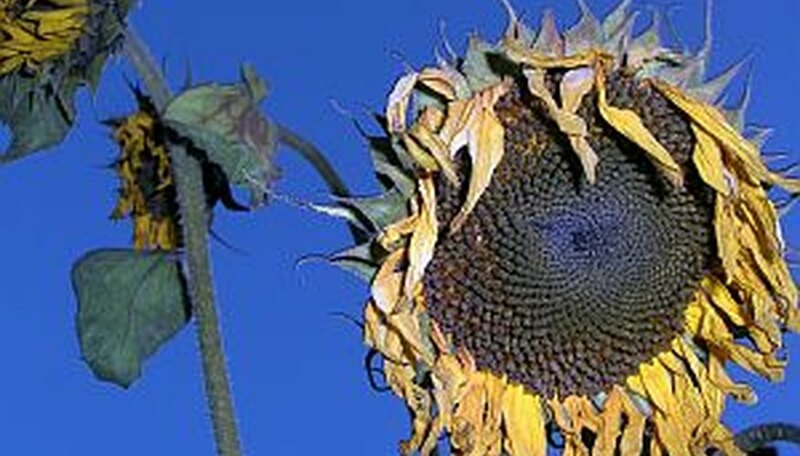 Store the sunflower head in a dry location with plenty of ventilation to dry the seeds. The drying time may take up to one month. Spread a sheet of parchment paper on a work area and place the dried sunflower head on the parchment paper. Loosen the seeds from the sunflower head by rubbing your hands firmly over the seeds. Shake the sunflower head upside down while rubbing the seeds with your hands. The seeds should readily fall out of the flower head. Store the seeds in a standard letter envelope in a dry, cool location to plant next spring. Do not place the seeds in a sealed jar or plastic container because the seeds may develop mold in this kind of storage.